The seller of today’s Nice Price or Crack Pipe Corolla says the pictures in the ad are a year old, but that the car currently presents much the same. It’s not a car you see at all much any more so let’s find out if its price is what makes it a real looker. It’s long been advocated in song that you don’t tug on Superman’s cape, you don’t spit into the wind, you don’t pull the mask off that old lone ranger and you don’t mess around at the gym. You can now add to that not-to-do list yesterday’s 1975 Datsun 280Z with an SBC as both in comments and its 82% Crack Pipe vote, buying it was considered an act that would change your life for the poorer. Speaking of the poor—remember them? Oh, yeah, that’s us. Regardless, what car is most closely identified with those of lessor means? I guess that would depend on the country, right? In Germany the traditional Beetle might be the most appropriate choice, while in France perhaps it would be the Citroën 2CV. Here in America, Henry Ford extended the privilege of auto ownership to a wide spectrum of the socioeconomic strata with the Model T through the efficiencies of manufacture and simplicity of design. That strategy has been copied time and time again, and in Japan that offering of the principle of simple and good that is simply good is perhaps best exemplified by the Toyota Corolla, the company’s long-running nameplate for the the masses. Here we have an example of a Corolla that’s a little fancy, not putting on airs so mind you, but still not your agrarian-level simplicity either. This 1980 Corolla Hatchback was joined on the dealers’ lots by a four-door sedan, two-door coupe, a wagon (we had one of those last week) and the shooting brake-like Liftback. Have a gander at those lines if you will. That’s a damn-fine looking automobile. This one is seemingly in remarkably good shape as well. I say seemingly as the seller has posted the ad with photos from a year in the past—likely when he purchased it—although he says it looks much the same today. I say, don’t tell us, show us! The car is being offered in Minneapolis, however those year-old pics show it with California plates and a sunny disposition. The ad notes some fading from the warm California sun, but that’s far better than it falling off from the cold Minnesota snows and salty roads. Wheels are period correct but car-incorrect, having originally underpinned a Celica. Still, they look just fine here. Inside there’s white vinyl and a black dash, a melding of hues seemingly worthy of a song by Paul McCartney and Stevie Wonder, and yes, now you have that stuck in your head for the remainder of the day. You’re welcome. The upholstery is in great shape, perhaps owed to the heavy tint that has been placed on the back windows. A woody Momo steering wheel also dresses things up nicely. The only issue in here might be the dents in the back seat that show evidence of a child safety seat once having been used there. yeah I know, I should work for CSI. Well, to be honest, there’s another thing in here you might not like. That’s the automatic transmission shift lever which of course is attached to an automatic transmission. The three-speed slusher makes this a less engaging car, and with only 75-horsepower to its name the 3T-C 1.8-litre four under the hood doesn’t have much to give in the name of shifting convenience. That’s okay those because not everybody needs a car with a ton of power or has yet to master the three-pedal two-step. I think this would make for a funky and fun first car for a teen driver, or perhaps for someone seeking to make a romper-stomper out of it seeing as it’s a solid but less desirably equipped base. Mileage is unknown as the ad claims the odo broke at some point in time and had to be replaced. If you’re broke then it really won’t matter what this car costs, but seeing as most of us can likely manage to rub two pennies together let’s take a look at this Corolla’s price. That’s $3,500 which is poor-people range as well as rich. 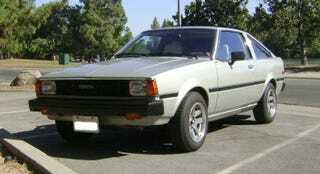 What do you think about this Corolla for that kind of cash? Does that seem like a deal? Or, is this a hatch that asks too much of someone’s nest egg? H/T to GTXcellent over on Hooniverse for the hookup!